Why do you suppose spammers and hucksters and phishers and endless social media promoters desire your email address so badly? Every time you download something (even for free) the one price of admission they always seek is your email address. Am I right? Next to your phone number and your social security number, and maybe your physical address, your email is one of the most coveted pieces of personal information a marketer can glean from a prospect. You read your email every day, right? I’ve been denying the truth for too long. 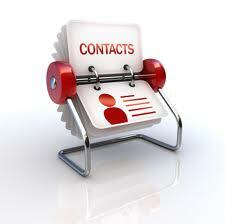 All these contacts are gold. Not only as individuals, but as occasional mass recipients of a message from you. Obviously, you don’t want to spam, but what if you need to get a timely message out, and you want it to go to the right people, for altruistic reasons, or even for reasons that will benefit the receiver? What if you have a great marketing campaign, and it needs to go to prospects who need to be reminded that you’re open for business? Tastefully done, this is a powerful tool. How are you contacting your friendly repeat customers? Follow-up is so important. So if you agree, and you believe management of such lists are important to the health of your voice over business, then the questions becomes how to best manage this — DATA. Once you enter this realm, you’d better be ready to deal with spreadsheets, and .xls files, and Excel, and it helps to understand what a .csv (comma separated value) is. As the PR guy for WoVO, I’ve spent the better part of the last two weeks educating myself on mailing lists. Actually, two weeks is nothing. I’ve barely scratched the surface…but I’ve learned a ton. It was so overdue. As a prodigious collector, and a maker-of-lists, I’ve been saving emails, opt-in lists, and subscriber lists for years. Yes, years. Have I done anything with it? No. Almost nothing. But, lists are funny things. They tend to be duplicative. The same names keep popping up in congruent lists. You don’t want to appear bumbling or spammy by sending the same message to the same guy three times. That’s counterproductive. OK, I’m finally getting to the heart of this blog article. To arrive at a “CLEAN” list — one without errors, bad addresses, duplicates, and old data — you’ll want to use comparison or what’s called “de-duper” programs. Without them, you will spend HOURS in manual labor. Tedious and time-consuming. Basically, you ask the software to sift through the list you have and find duplicates. Or you have two similar (or what you believe are very similar) lists, and you want to compare them or even combine them to one “clean” non-duplicating list. This is not perfect. At some point, you WILL have to eyeball the list on your own for the names you want and don’t want in the list, but with the comparison and de-duper software, you at least know you’ve got a working (candidate) list worth the time of your review. Part of my time in the last month, has been searching for the right tools. I’m going to share them with you now, and I must tell you: of all the qualified lists I’ve shared in recent years on this blog… I’ve never worked as hard at any of them, as I have this list. This is an extremely useful starting place, but includes comparison software for binary files, source code, pdf files, C++, and even Unix users. So not all of it is to-the-point for the scope of my needs. I’m looking for Excel file comparisons. Reviews of Comparison Software This is also a valuable comparison chart of…well…comparison software. DQ Gobal Dedupe4Excel seems to be the perfect solution. You can download a 14-day trial version that handles lists up to 250 lines. I didn’t spend a lot of time with it, ’cause my lists are longer than that. And here’s the main rub: The full version costs $155. It may be great software, but I was seeking something not as feature-laden, but with a lesser price-tag. ESQSoft Deduper is free. There’s nothing to install. It’s all done online. Enter your list in the left pane, set your parameters, hit the “dedupe” button, and the resulting “clean” version appears in the right pane. I like this product, but more than once, I noticed that it didn’t grab all the duplicates. Maybe I didn’t set the parameters right. I’m also suspect of free software. I realize it’s a bias I have. But why would someone offer such a useful tool for free? Excel Compare is deduping/comparison software I’m recommending. The price is right ($35) , it’s an intuitive interface, it’s fast, and it’s effective. Compare Suite I REALLY like this software. There’s a Freeware version which I have not tried. I’ve downloaded their free trial Standard Edition, which is good for 30 days, and was VERY impressed with the ease-of-use. It also compares Word docs, PowerPoint docs, PDF, RTF, and Open Office docs. The Standard Edition is $70 to purchase. A Pro Edition is $140 but I don’t see THAT much difference between the Standard Edition that a VO would need. That’s it! Happy List De-Duping! Another great article, Dave! I’ve been considering steps for creating a marketing funnel for an astounding landing page idea, yet collating contacts from disparate lists seemed overwhelming until now. ‘Glad you found something of value, Michael… I really researched this area… and feel I was giving out good info. Good luck with it!